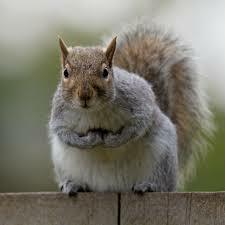 There are several big, fat (thanks to me) squirrels who hang around our yard, getting into mischief, tormenting the cat, eating top shelf bird food, and generally being nuisances. They are fun to watch, though. There is one in the tree right now, making eye contact with Woodrow. He is sitting on a branch of the apple tree, staring into the cat's eyes. Just like this. I just mentioned to Regis that he has quite the pessimistic demeanor today. He told me that it didn't matter that PHC was getting good reviews because it is a dying market. When I looked disturbed, he comforted me by saying I will most likely be dead before that happens. Oh, boy. It's easy to get sucked into the rabbit hole of anger and pessimism. It's why I avoid the news...it colors my view of the world. There's a robin sitting in my redbud tree. Now there's optimism.